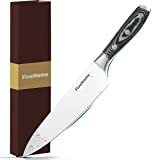 ?Premium German Steel:This 8 Inch Knife Features an Ultra Sharp 4116 ThyssenKrupp German Steel Blade at 55 Rockwell Hardness Producing Extraordinary Cutting Performance and Edge Retention..
?Razor-Sharp Blade: iHOMEER GHC 8 Inch kitchen knife is made with razor sharp, laser-tested, tapered knife edge that provides it maximum sharpness and edge retention that can cut through beef, pork,chicken,pock and so on..
?Superior Performance: This German blade is wider than other brand, It has been especially designed for Cutting, Dicing, Slicing, Chopping & Mincing and also cuts meat off bones. 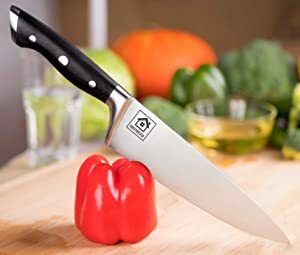 Effortlessly Cuts Meat, Fish, Fruits, Vegetables and much more..
?Extraordinary Handle: Feel the difference with the Pakkawood Handle, Triple Riveted to the Full Tang for Greater Balance & Longevity. 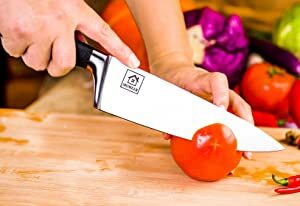 The Rounded & Tapered bolster Handles are Ergonomically Designed to ensure Total Control and Comfortable Grip..
?iHOMEER's Guarantee: 100% SATISFACTION OR MONEY BACK GUARANTEE, try it risk free. We offer our fan-favorite 18-month warranty and friendly customer service. 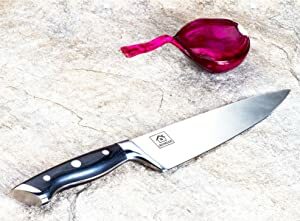 And this Knife with it's Exquisite & Premium Package makes for an Ideal Gift..
iHOMEER GHC Series 8 inch Chef Knife is designed for professionals who include chefs, culinary experts, food caterers as well as an ordinary person. 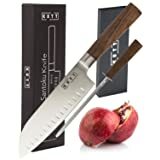 It is a multipurpose knife that is ideal for various tasks which include cutting, chopping, dicing and slicing vegetables, fruits, fish, meat and other food. 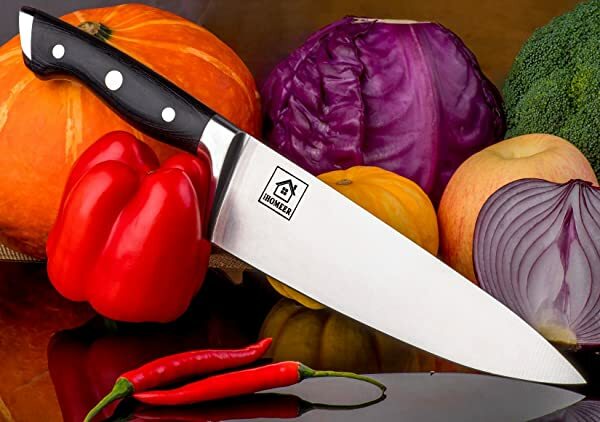 This knife is made of high quality stainless steel material and advanced technology fom Germany. ?Precision forged, ultra sharp, wear resistant, single-piece, high carbon ThyssenKrupp German steel at 55 Rockwell. 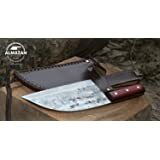 ?The edge is painstakingly hand sharpened to 16-18° per side, maintaining the perfect balance between blade sharpness and maximum resilience. 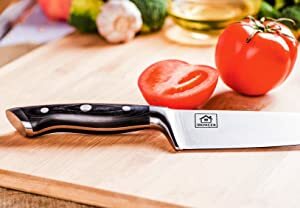 ?Beautiful hand polished satin finish blade, Tapered design for hardness and flexibility. 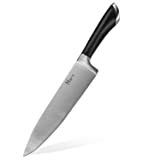 ?Polished spine to facilitate a comfortable pinch grip, Full tang for incredible robustness & quality. ?Triple riveted for even more durability. Cleans easily for low maintenance. ?Ergonomic handle shape for maximum comfort, grip and maneuverability. ?Mirror polished, finger protective bolster provides for a perfectly engineered balance with just the right heft. 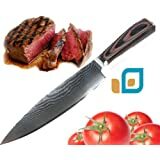 ?Premium quality laminated pakkawood handles imported from Spain, for superior strength, refinement, and beauty. If you is not satisfied with purchase of iHOMEER product, please contact us for an unconditional refund or replacement. Try it risk free. 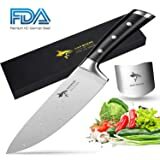 Marx Kitchen 8-Inches Chef's Knife,Best Quality Stainless-Steel Ergonomic Handle.